If you are an African-American and is reading this post, has this title sunk in yet? Does it even make sense to you? I understand that someone once said “If you want to hide something from black people, put it in a book.” Well, let’s just call this my prelude or preface; to a seemingly ongoing epidemic in my life as an African-American. I was going to call this post/blog “Can You Define Yourself, Black America?” However, I think I’ll wait until a later and a more proper time. Recently, I’ve seen mass hysteria going on in my community in regards to the latest release of a certain athletic shoe. This shoe just isn’t a shoe; it’s a pair of Air Jordan’s. Yes, Air Jordan’s. You know the guy who was famous for his high-flying, dominant scoring, aerial acrobatics with the basketball; and for leading the Chicago Bulls to 6 NBA titles in the early and mid-90s. Michael Jordan is that guy (for those living under a rock somewhere) who hasn’t played a professional NBA game in over a decade (since 2002-03 season). Mr. Jordan turned 50 years old this past February and now is the proud owner of a struggling NBA franchise, the Charlotte Bobcats. 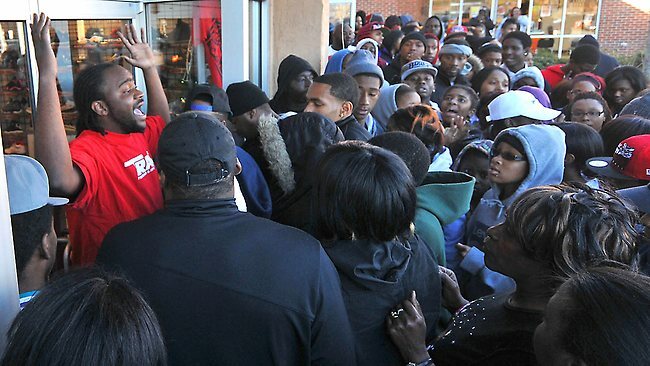 Jordan has never publically, (at least to my knowledge) said anything about what is now called the “Black Friday” for many black people when his shoes comes out. Oh, the irony. I was a longtime supporter; wait a minute, I WAS a longtime idolater at the altar of Mr. Jordan that I used to read up on every book, video, or game that ever included him. I used to fantasize about playing like him, talking like him, even wore a cheap flea market jersey every time his games came on. To put it plainly, I loved him more than my own Father. Unfortunately, that dream of becoming him didn’t come true because I didn’t grow physically. In a matter of years my dream of playing ball like Mike was interrupted due to hormones and heredity. The point is, as much as I worshipped and adored Jordan; buying his shoes and apparel was line I wasn’t going to cross. Why? Because my parents taught me the value in the word called “no.” My parents didn’t believe in a child having shoes that not only they couldn’t afford; but the child couldn’t afford as well. They preached hard work, responsibility, discipline, and the true value of a dollar. These are values in which one can “stand” for. From Jordan’s to Starter jackets, from Gucci to Louie Vat ton; it seems like the black community will literally STAND in line for the latest trinkets and fashions. And then STAND around the corner ready to pounce, shoot and rob the person who purchased the merchandise. Howbeit, these same people will return to the same ‘hood’ in which they live to show off their new-found piece of ‘glory.’ We will STAND up for the latest street thug for keeping it real; then cry out there’s no real or quality black men. I understand some people will say after reading this, “It’s not all or White people do it with cell phones etc.” The problem with that is the African-American community consumes (spends) the most out of any minority or people group in the United States. According to Experian.Com, African-American buying power will reach an astonishing $1.2 trillion, meaning that almost nine cents out of every dollar spent in the United States will come from African-American consumers ( as of 2013). I do not write my blogs to purposely offend, derogate, or disrespect my community. However, when will enough be enough? We STAND in line at Hip-Hop shows which do nothing but disrespect and sell their souls for money and fame; at the price of promoting ignorance and preconceived stereotypes. We STAND in the offering line due to a perverted or misguided preacher giving our ‘all’ in trying to live the ‘’blessed life;’’ or at least to look good for Passa and them. We STAND when we heard about Trayvon Martin; yet refuse to STAND about the violence in our own communities. We will STAND on a block in our neighborhoods all day acknowledging a place we don’t own. Yet we won’t STAND in the job line, P.T.A. meeting or for better education. We will stand and be comfortable with being strong single parents; yet we won’t STAND for abstinence, birth control, or marriage. Black America; materialism, consumerism, self-hate, jealousy and murder is destroying us. No matter how much ‘we’ learn about ourselves; the problem is the human heart-which is the heart of the problem. I’m not trying to section off a part of humanity; just trying to awaken a community in which I am a part of. Peace.